The Brabus K4 is essentially a kitted up model W211 Mercedes Benz E-Class powered by the M271 4-cylinder 1.8 litre Kompresser engine tuned to 193hp and 260Nm of torque. This would put it on par with a tuned up version of the same engine in the E’s younger brother, the Mercedes Benz C230K, though the Brabus has slightly more power. paultan.org contributor Dr. S.P. 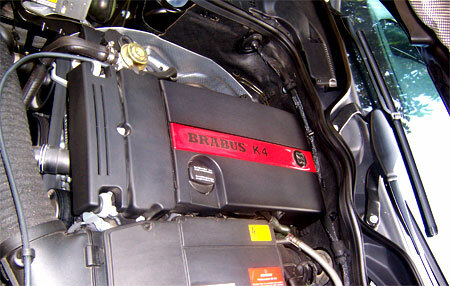 Long shares with us his valuable views on the Brabus K4 from a “standard” W211 Mercedes Benz E200K owner’s perspective. To begin with, the differences are subtle on the outside. 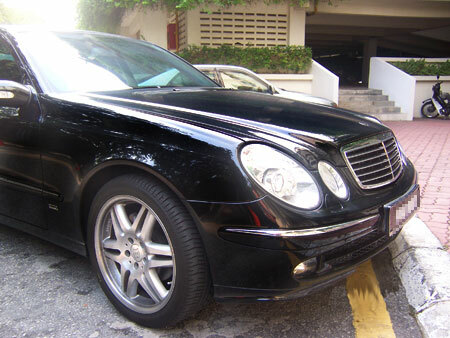 Of course, just like once Ford used to say â€œYou can have it in any shade as long as its black.â€ this tuned-up E-Class looked sporty yet elegant in this very dark metallic. Those with a keen pair of eyes would notice that the much coveted three-pointed stars are replaced by circular (and flat!) â€˜B logo badges both at front and rear. Alloys are Brabus Monoblock 18â€ wrapped in Pirelli P-Zero 245/40 ZR18 rubbers. 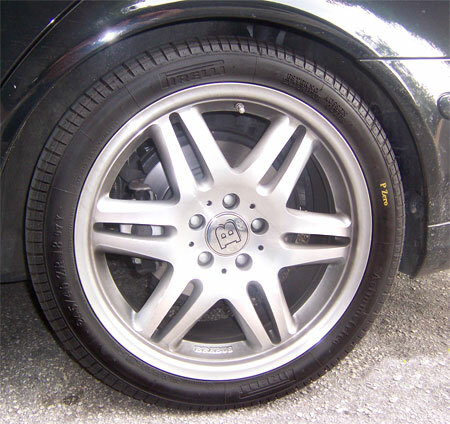 Wheel arches clearance are lesser, thanks to the lowered Sports suspension. Meanwhile, the tracks are wider at all 4 corners â€“ with 7mm spacers placed laterally to the disc rotors all around. Internally, the icing on the cake â€“ aesthetically as well as ergonomically â€“ must be the chunky Brabus Sports steering wheel. 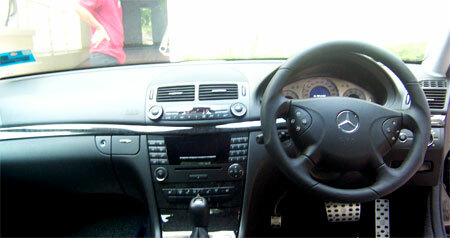 Its black and full leather â€“ a much welcomed change to the uncle-ish grey or brown ones with wooden inserts. The rest of the stuffs and gadgetries are pretty much Avantgarde standard issue e.g. Keyless-Go, panoramic roof et al. Firing up the supercharged engine is no different from my regular ride. There is also none of those bombastic exhaust note or deep engine growl on the go. But let these not deceive you because this car feels like it can do sub-9secs to the century sprint anytime, anyday. 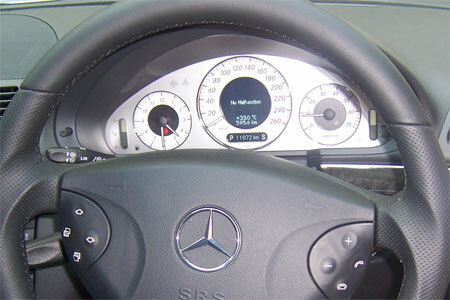 Pelt the rev counter past 3000rpm, and the remapped Kompressor motor ROCKS â€“ all the way to redline! One thing I cant fathom though is the somewhat lethargic â€˜lag below 1800-2200rpm â€“ depending on which gear you are in â€“ which is still prevalent despite the works done by this famous tuning house. Having tested the entire local M271 engine Kompressor â€˜variants (from the C180K to C230K), I still find this uncharacteristic supercharger lag rather frustrating at times. 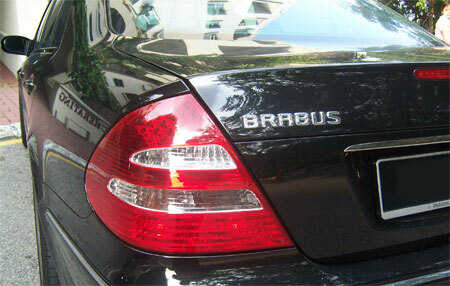 Nevertheless, this Brabus K4 is still addictively powerful when you work that throttle â€“ much like an E200K with a C230K engine! The 260Nm on tap is very useful when overtaking and gunning straight uphill. Steering is heavier here while turning circle is bigger with the widened tracks up front. The rack felt communicative and more confidence-inspiring even at illegal speeds. I must say it even fared better than the standard Parameter steering found in the newly launched E280! The original Pirellis grip with conviction around bends, also taking up those yellow-painted speed strips in stride despite being ultra-low profile. Surprisingly quiet on the run too! Take this K4 right into a corner â€“ brake just a little before you enter â€“ smoothly usher into the apex and push the gas pedal as you exit wider, the RWD dynamics in cahoots with the stiffer dampers will sure put a smile on your face. Yes, it was truly sweet since this recalibrated K4 seemed to have done just that with a tad more finesse than my stock-standard E200K. Tracking stability and lane-change composure are also better than my â€˜normal E, albeit just marginal I reckoned. Another wonderful surprise must be the still supple and good damping despite running on upsized wheels and uprated springs. Its perfectly comfortable up front with maybe just a little more stiffness for the rear guys (and gals) over really bad ruts or potholes. Riding over the speed bump is where the glaring differences between Elegance and Avantgarde suspensions settings are seen clearly. There has been many a complaints in auto forums regarding this hi-spec version suspension noises. Since this K4 is basically Avantgarde-spec sprung – plus revised damper rates and lowered springs by Brabus â€“ I too noticed a rather low decibel suspension rebound squeaks, when gliding faster over bigger road humps. A minor fault by engineering design I suppose. Stopping the K4 is very reassuring too. Typical of the W211s SBC, braking provides a strong bite at the rotors yet at the same time theres a wonderful progressive feel at pedal. Of course, there are concerns about the durability and reliability of this Boschs electro-hydraulic brake system, but thats another storyâ€¦probably for a running report elsewhere. I ended this almost two hours drive with a glee on my face, having tested a truly capable luxury sports saloon that would be great chomping down highway miles at high speed with ease – in style and in comfort. And also quite at home snaking away on some B-roads if thats where your destination takes you.